A trio of bridges arching over the canal ways of the River Ill, the Strasbourg Covered Bridges are an iconic symbol of the city, marking the gateway to its central Grande Ile. Somewhat confusingly named, since none of the three bridges remain covered, the bridges once formed an important part of the city’s medieval fortifications and featured wooden canopies from where soldiers could protect the dam below. 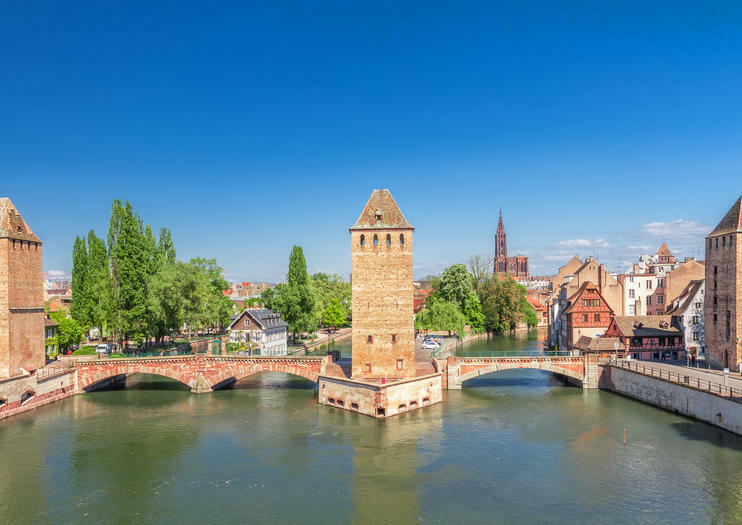 Today the bridges are a lasting vestige of medieval Strasbourg, and while their ramparts were destroyed back in the 18th century, the remains of the 14th-century square towers that once linked the bridges together still stand. The historic bridges are best viewed from the grass-topped terrace of the nearby Vauban Dam (Barrage Vauban), which offers panoramic views of the surrounding La Petite France district, or on a boat cruise around the city’s canal ways, passing beneath the arches of the fabled bridges.